Italy is a dream destination for wine lovers and Rome has no shortage of bars in which to explore the country’s best vino. From elegant establishments with huge cellars and rare vintages to rustic backstreet drinking dens serving up local wines on tap, you are never far from your next glass. So here are some of our favorite places around Rome for a little alcoholic liquid refreshment. The most recent addition to the Roscioli empire is completely focused on wine and boasts over 400 bottles to choose from (and no fewer than 70 by-the-glass options, including some very special vintages) and lots of food and wine pairing options so drop by to try something new. Blink and you will miss this tiny wine bar just a few steps from Piazza Navona. Hole up at one of the handful of tables inside for an intimate, laid-back wine experience in the heart of the city. 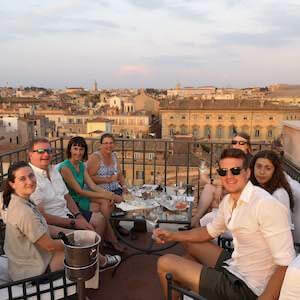 Local favorite Ai Tre Scalini is open for food and drink all day but truly comes alive in the early evening when the welcoming interior is not enough to hold the crowds of drinkers who spill out onto the picturesque Monti street. Rustic and authentic, Il Goccetto is housed in a 16th-century building and offers visitors a great range of labels by the bottle and glass accompanied by a menu of delectable snacks to stem your hunger. Away from the usual Vatican tourist traps, Passaguai’s snug basement is the ideal place for a warming glass of vino in tranquil surroundings, and there is a nice selection of cured meats and cheeses to sample along with your drink. Ferrara’s ancient wine cellar houses their impressive list of bottles which are available to drink in-house or take-away. There are also good options served by the glass together with a convivial atmosphere at aperitivo time when your drink comes accompanied with tasty plates. Just a block from the Colosseum, Divin Ostilia is a hidden gem in a touristy neighborhood. With great wine options, good food, and reasonable prices, it’s a warm and welcoming spot for a post-sightseeing refuel. Learn more about Italian wine and visit some of our favorite wine bars in four different neighborhoods on our Rome by Night Tasting Tour, try delicious Italian sparkling wines at our Prosecco, Spumante and Bubbles Tasting in Rome, or try wonderful Italian wines paired with cheese at our dedicated Cheese and Wine Tasting in Rome! Discover where to drink great Italian wine in Rome. Visit one of our favorite enotecas and wine bars to taste excellent wine and experience Roman nightlife.